Bathroom remodels are the second most common type of remodel, making up 80% of new projects, and trailing closely behind kitchens (which make up 81% of new projects). Below, we’re breaking down some of the biggest trends in bathroom remodeling so that your next Marsh project showcases the latest and greatest in cabinet design. The Houzz study revealed that today’s homeowner expects their master bathroom remodel to create a space where they can unwind and re-energize. It isn’t only functional, but a spacious and luxurious retreat. That’s why one in four homeowners choose to increase the size of their bathroom as part of their remodel, with up to 35% of millennial homeowners opting for a larger bathroom. Of those who chose not to increase the size, 30% said their space was too small. Ditching the bathtub is among the most common ways of creating extra bathroom space—homeowners getting rid of a tub generally fill the extra space with statement showers or new cabinetry. Recommending a luxurious shower or vanity in your next master bathroom design is likely to be met with enthusiasm, given the current market trends. Supporting the need for an open master bath is the continued momentum of both contemporary style and a neutral color palette. 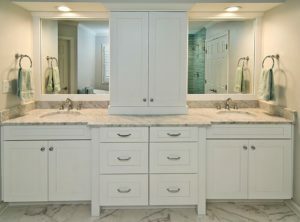 While gray is the most popular wall color chosen in bathroom remodels, white remains the dominant color for cabinetry. When designing a new space for your clients, consider adding a vanity or Marsh tower cabinet in our signature Alpine finish—this bright white paint can transform any space by reflecting natural light and visually enlarging the room. Cabinets warrant special attention because homeowners are more likely to splurge in this part of the remodel, with 40% of those surveyed saying they splurged on their bathroom vanity or cabinets. Willingness to invest a little more for quality indicates the significant role cabinets play in transforming a room. In the bathroom above, our tower cabinet in an Alpine finish is displayed prominently as a source of functional bathroom storage. One of the latest additions to our product line, the tower cabinet beautifully enhances bath design. For high quality cabinetry at a value, visit our gallery and browse the Marsh Cabinets collection of door styles and finishes. Houzz economists also found that older homeowners are more likely than millennials and Gen Xers to splurge on their bathroom remodels, because they are investing in aging-in-place design. Three in five say they plan on staying in their home for at least 10 more years, which drives their higher spending habits. If you’re a builder or renovator, becoming a Certified Aging-in-Place Specialist may be a good way to ensure that your renovation skillset caters to a wide range of consumers.